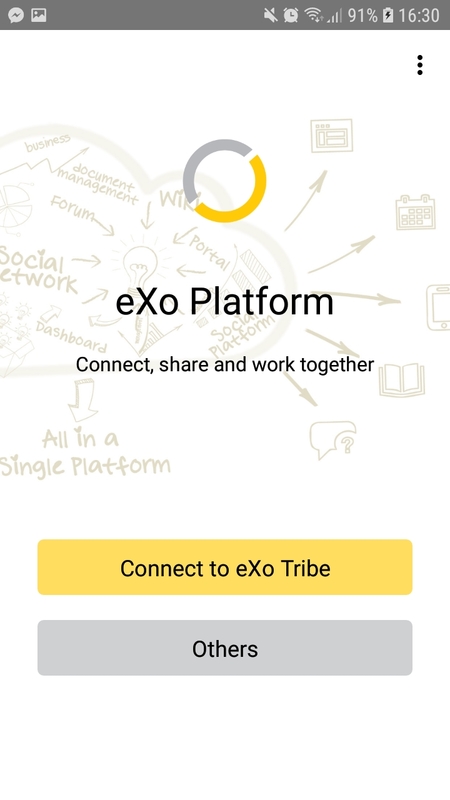 eXo Mobile enables you to connect and collaborate on the go. Native iPhone, iPad and Android apps integrate easily and securely with sites built on eXo Platform. Follow the latest updates from your colleagues and groups, interact with your personal dashboards, browse and edit your files, and more, at any time, from anywhere. You can receive messages from co-workers, follow your group’s latest activities, and collaborate in real-time. You can also see when changes are made to the wiki pages, forums, calendars or documents you consider essential to your work. 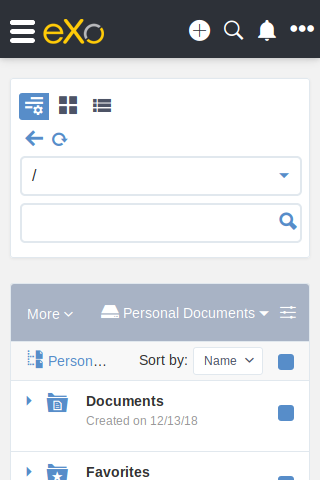 The left menu allowing you : - to move from one page to another: home page, people, forum, wiki, documents… - to select a space from MY SPACES list. 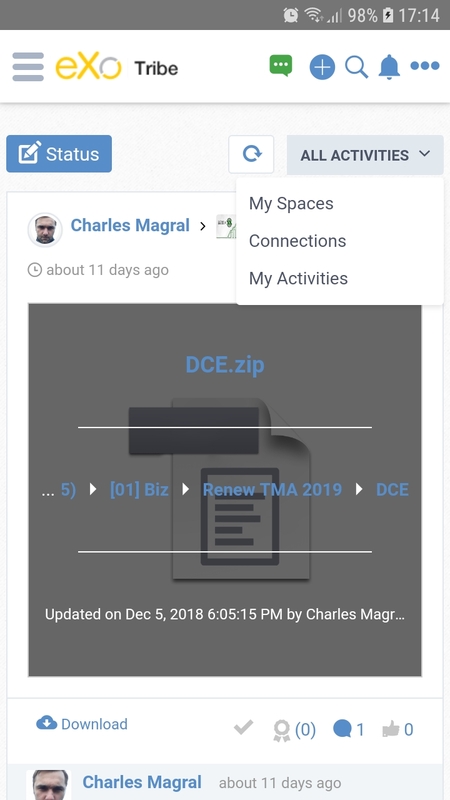 You can easily access your documents using your mobile device’s native document viewers, for a more user-friendly experience. 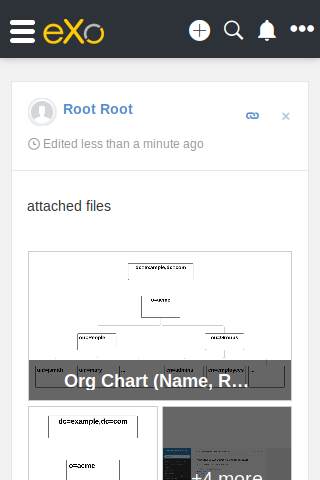 eXo Platform’s document management capabilities synchronize user permissions across the social intranet. As of version 2.5, eXo Mobile makes it easy to create, edit and use multiple accounts in the app. As before, the accounts are accessible on the initial login screen. 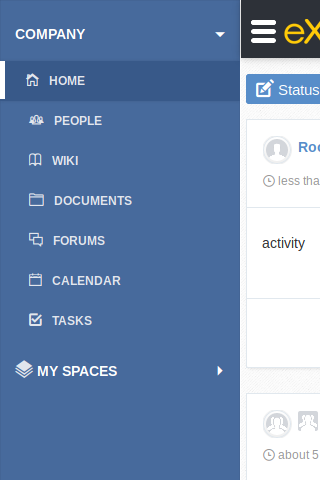 One difference though is that the Accounts tab appears only if you have more than one accounts configured. Share a snapshot of a recent whiteboard session or a new product prototype with your co-workers. 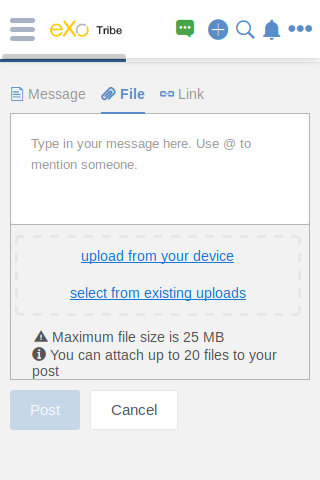 Your images and files could be added to your eXo Platform social intranet directly from your mobile device. By default eXo Mobile does not store your username and password, ensuring that only you can connect to your account. Files and cache stored on the device are placed in a private folder within your app, only accessible to your app’s process. Basic authentication is used so your credentials are not clearly visible on the network. For improved security, configure HTTPS on your server and use a https URL. Designed to leverage the unique features of iPhone, iPad and Android devices, eXo Platform native mobile apps let you access and interact with your social intranet in a familiar environment.